I’ve made this dish off and on over the years, with frozen and fresh spinach, and with uncooked and fried paneer. I like it best with fresh, relatively mature spinach and with fried paneer. I cheat and get the frozen fried paneer available in my international grocery store. You can also fry paneer yourself; for that matter, you can make paneer from scratch, but I’m happy with the store-bought stuff. 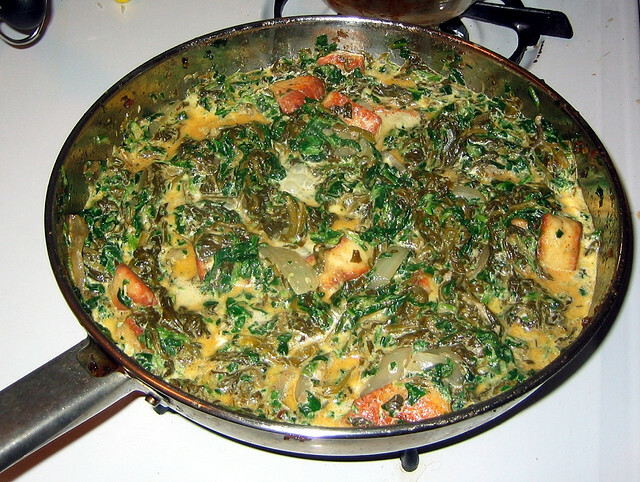 There are many ways to make palak paneer, including using a different type of greens, such as chard or mustard greens, in which case it is more properly called saag paneer. You can cook it quickly or for a long time, use fresh or tinned tomatoes (or no tomatoes at all), and of course you can vary the spices. This version tastes pretty close to the kind you get in north Indian restaurants, but it’s not as rich or greasy, and I don’t pulverize the spinach. I find that cooking it for a longer time gives me a similar consistency and flavor without having to drag out the food processor. Dice onion finely and mince garlic, ginger and chile. Dice peeled tomatoes. Wash spinach, spin to remove most of the water, and cut leaves into strips or chop roughly. Heat canola oil in deep skillet or wide saucepan. Add mustard seeds. When they start to pop, add fenugreek and cumin seeds, cook for a minute. Add onion, garlic, ginger and chile and cook on medium-low heat until onions are transparent and starting to brown (about 5-7 minutes). Add tomatoes and cook for 2 minutes. Add turmeric and garam masala, cook for another 2 minutes. Add butter and stir it in as it melts. Add spinach (in batches if the pan can’t accommodate all of it at once). Stir to combine. Add salt. Cover the pan, turn heat to low, and cook for 45 minutes, stirring occasionally. The spinach will turn dark green and break down so that the individual leaves are less prominent, and the mixture should dry out (add just enough water to keep it from sticking in the pan if it dries out too much). Add the paneer, stir to combine, cover and cook for 10 minutes or until it is warmed through (I use frozen paneer that I’ve taken out of the freezer when I start cooking). Remove from heat and stir in the yogurt or cream. Eating it right now and it has the seal of approval. Excellent! That’s great to hear.